plate 1. 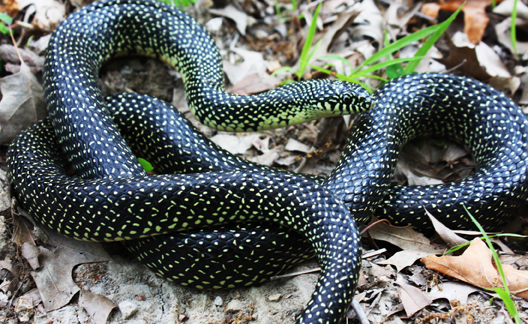 A Speckled Kingsnake (Lampropeltis holbrooki). This species is found throughout the Ozarks, and can be recognized by the yellow-on-black mottling. Night falls. 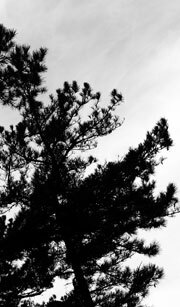 The air is warm in the darkness. Overgrown meadows and abandoned farmyards come alive, first with insects, then vermin. Mice. Voles. Shrews. Rats. All hurrying to eat, to store, to prepare for the onrushing winter that — deep within their genetic memory — they know is coming. In the darkness, something else moves as well. Near-silent in the weeds, a hunter moves forward, tongue-flicking, testing the air. A copperhead slithers over rock and around branch. Soon, it will strike. And feed. The venomous snakes of Missouri are patient, fearsome predators. This is a story we have heard before. However, tonight is different. Tonight, the hunter becomes the hunted. Nearby in the weeds another hunter advances, tongue-flicking as well. A speckled kingsnake has caught the scent of its prey: the copperhead. Nearing the would-be predator, the kingsnake strikes! Coil around coil they fight, biting one another. The copperhead injects the kingsnake with its venom, yet the kingsnake doesn't let go. The copperhead begins to lose oxygen under the tight coils of the kingsnake, eventually going limp. Sometimes, it’s good to be the king. plate 2. 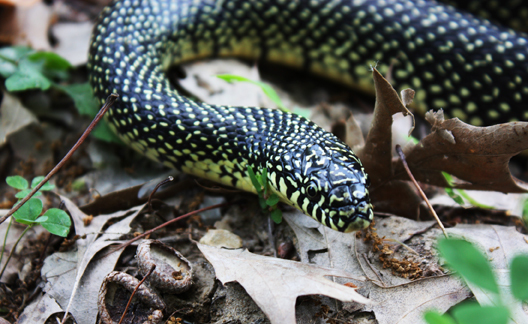 This Speckled Kingsnake was photographed just north of Springfield, MO. Conservation Areas managed by MDC are great places to hike look for these interesting snakes. As the summer reaches its peak, warmer days mean animals which depend on warmth to move about (hunting, eating and seeking out mates) will be seen more frequently by people. Of course, I'm talking about snakes (although all reptiles fit this bill). As we’ve covered in a couple articles before, the Ozarks are home to quite a wide variety of snakes, most of which are not dangerous to people. We have snakes in all shapes and sizes, from the pencil-thick ring-necked snakes, to the road-spanning black rat snakes. We even have snakes of royalty! Missouri is home to three different species of kingsnakes (Lampropeltis). Most common in the southwest region is the speckled kingsnake (L. holbrooki) which has a beautiful black-and-yellow flecked pattern. Farther to the north — where the Ozarks starts to level out before turning into prairie — you'll begin to find the prairie kingsnake (L. calligaster). Prairie kingsnakes are light-brown with dark-brown saddles running the length of the body. The third king of Missouri doesn’t share the same title of office as the others but is kingly nonetheless. 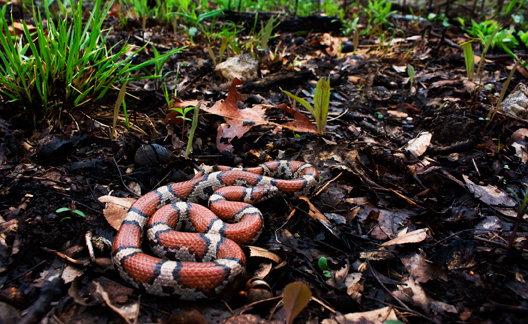 The milk snake (L. triangulum) is in the same genus and closely related to the other kingsnakes. plate 3. A Milksnake (Lampropeltis triangulum). These snakes are very colorful, and easily recognized. The reason for their name — and perhaps the most striking aspect about kingsnakes — is that they prey upon other snakes (even venomous ones). 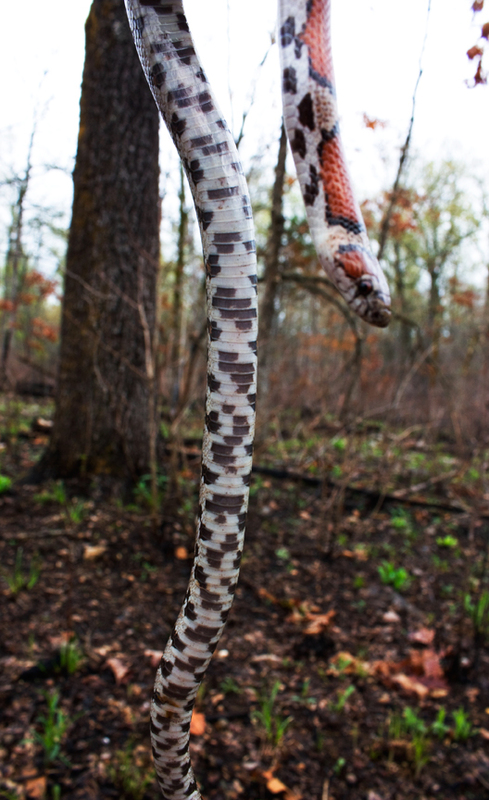 Kingsnakes have a unique natural resistance to the venom of copperheads, cottonmouths and rattlesnakes. Venomous snakes rely on their venom to do most of the work when making a kill. Thus they are only in contact with living prey for a short period of time. The advantage is that they are less prone to being attacked by their prey. I’ve seen venomous snakes that had been bit to death — or even decapitated — by a mouse or rat. These snakes don’t have much in the way of muscle. Kingsnakes are a different story. plate 4. 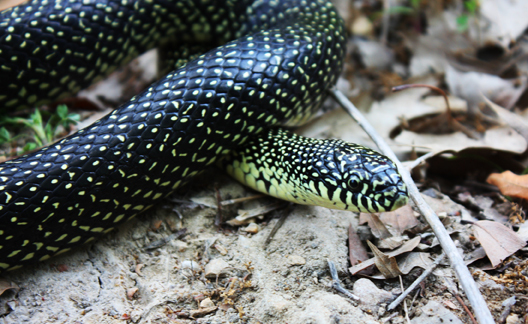 This juvenile Speckled Kingsnake was nearing a shed (note the glazed eyes). Kingsnakes rely on brute force. Kingsnakes — as constrictor — wrap around their prey and squeeze it to death. Contrary to popular belief, constrictors don’t squeeze with the intent of breaking bones or suffocating their prey. Instead they aim to simply cut off blood flow to the body. Unlike venomous snakes, kingsnakes’ heads are roughly the same size as the rest of their body. You won’t see a smaller “neck” as you do in copperheads or rattlesnakes. Most kingsnakes don’t get much longer than four feet long (with milksnakes reaching less than three feet on average). Although they are constrictors, even an adult kingsnake doesn’t have the strength to post a threat to an adult or child. Like quite a few other snakes, kingsnakes try to “act tough” when pressured. They will hiss, strike or vibrate their tail like a rattler. Really, they just want to be left alone! In fact, of all the snakes I’ve encountered in the wild, kingsnakes have been the most docile and friendly of the large snakes. They’re quite a joy to stumble upon! Aside from other snakes, kingsnakes also feed on rodents, small birds and their eggs, and lizards. plate 5. Juveniles often have more vivid colors than adults. Sometimes, like this one, they have slightly different patterns. Kingsnakes emerge from their dens when the weather begins to warm, usually in April. During the temperate months, you can find them active during the day. However, even snakes can overheat if exposed to the sun too long, so when the summer heat begins, snakes seek shelter during the day and forage primarily at night. Strictly speaking, the prime times people are out and about is the time you would be least likely to encounter a kingsnake. 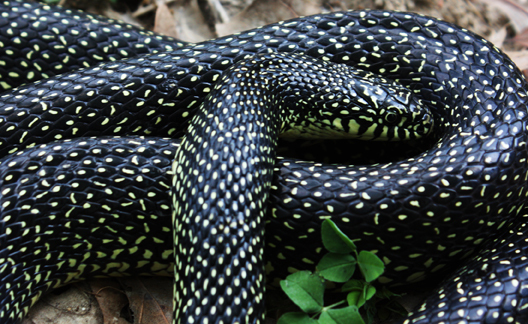 In fact, the most common time to encounter a kingsnake in the summer is on the road at night. On hot days, the road surface heats up and remains warm long after sunset. Snakes make their way to roads to warm up. Sadly, this is where most snakes meet their fate. Car-related incidents are one of the main causes of death for snakes. Kingsnakes mate after emerging from their dens in the spring, but they don't lay their eggs until mid-summer (June or July). They lay their eggs around old, rotted logs or under rocks they clutch may contain anywhere from 5 to 17 eggs (depending on the species). When winter comes, kingsnakes seek shelter in mammal burrows, caves, or man-made structures. plate 6. When threatened, perhaps by a bird or large mammal, a kingsnake will tuck its head into its body. Many snakes exhibit a similar reaction. 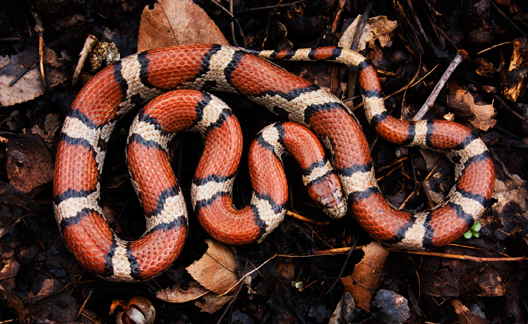 Out of the three species, the milk snake is particularly interesting for several reasons. It is one of the most colorful snakes in the Ozarks. We have the red milk snake subspecies here (L. triangulum syspilia) and true to its name this snake has beautiful rusty red saddles outlined in black on a white (or cream) base. The juveniles have vivid coloration (bright red, deep black, and stark white) which ages majestically into the rusty coloration of the adults. plate 7. Note the color pattern on this beautiful adult Milksnake and remember that although red-on-black is friend of Jack, all snakes in MO are our friends! One morning, a farmer went into his barn to milk his cows. He sat down his stool, got his bucket ready, and reached in to start milking when... HE SAW A SNAKE! Now, this snake wasn't just passing by, but was nursing milk right off the cow! He ran to get a stick to beat it away, but when he returned it was already gone. ...and the rest is legend. Of course, snakes don’t drink milk and don't have the capacity to suckle even if they wanted to. They’d much rather stick to more exciting foods. Red on yellow, kill a fellow; red on black, friend of Jack. This rhyme is used to identify some of the venomous coral snakes that occur in the US (it doesn’t hold true for the coral snakes in South America). However, no coral snakes occur in the Ozarks. When a person disturbs a snake, the colors can seem to blur together. Red on black may appear to be red on yellow, ending poorly for the snake. Remember, there is no other snake in Ozarks that matches the rhyme, so if it’s red on yellow or red on black, it’s all good! plate 8. The ventral surface of a Milksnake is salt-and-peppered, showing a beauty in contrast to the coloration of it's dorsal side. The genus Lampropeltis translates from Greek, meaning “shining shield.” This is perhaps due to the reflective nature of the scales on kingsnakes (as opposed to a more matte finish as on copperheads). The species holbrooki is simply a Latinized form of Holbrook, who was the first to describe the snake in the mid-1800s. 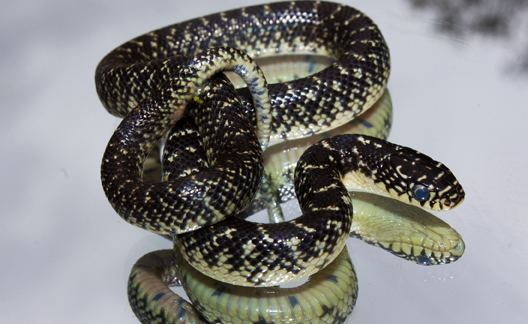 As a side note, L. holbrooki was recently raised to species status, being formerly a subspecies of the eastern kingsnake (L. getula holbrooki). 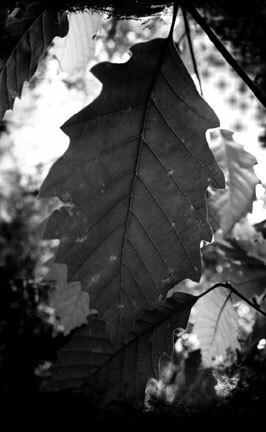 The species triangulum is Latin for “triangle.” This refers to the triangle-shaped side of the first blotch on the head. 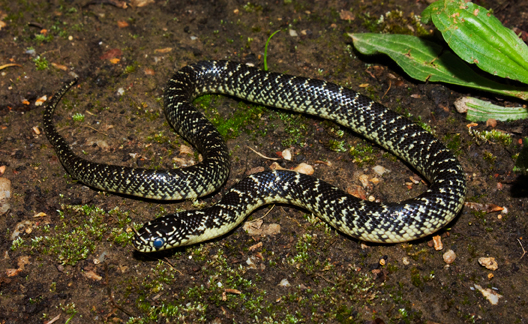 Subspecies syspilia is a likely candidate for species status as well (along with several other subspecies of milk snake). plate 9. Kingsnakes don't have the "large heads" that many venomous species do in the Ozarks. Just look at how cute this little guy is! As you go about enjoying your summer, keep in mind the royalty around you. Kingsnakes are some of the best snakes to have around. Not only do they eat venomous snakes but they also keep the rodent population under control thereby preventing damage to our property. If a snake is acting mean, it just wants to be left alone. Give it space and it will move along on its own. This applies on the trail on in your backyard. There is no reason to fear a red, black and white snake in the Ozarks. If you see a snake on the road, remember that they are a part of the Ozarks we love and give them a little extra room. All plates courtesy of Ben Dalton.